May 11, 2014 - Enemies, innocent victims, and soldiers have always made up the three faces of war. With war growing more distant, with drones capable of performing on the battlefield while their “pilots” remain thousands of miles away, two of those faces have, however, faded into the background in recent years. Today, we are left with just the reassuring “face” of the terrorist enemy, killed clinically by remote control while we go about our lives, apparently without any “collateral damage” or danger to our soldiers. Now, however, that may slowly be changing, bringing the true face of the drone campaigns Washington has pursued since 9/11 into far greater focus. Imagine if those drone wars going on in Pakistan and Yemen (as well as the United States) had a human face all the time, so that we could understand what it was like to live constantly, in and out of those distant battle zones, with the specter of death. 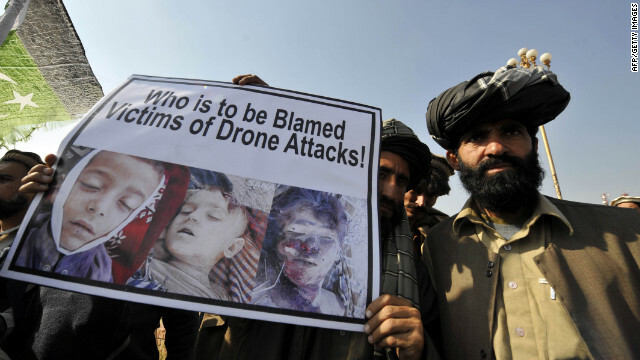 In addition to images of the "al-Qaeda" operatives who the White House wants us to believe are the sole targets of its drone campaigns, we would regularly see photos of innocent victims of drone attacks gathered by human rights groups from their relatives and neighbors. And what about the third group -- the military personnel whose lives revolve around killing fields so far away -- whose stories, in these years of Washington’s drone assassination campaigns, we’ve just about never heard? After all, soldiers no longer set sail on ships to journey to distant battlefields for months at a time. Instead, every day, thousands of men and women sign onto their computers at desks on military bases in the continental United States and abroad where they spend hours glued to screens watching the daily lives of people often on the other side of the planet. Occasionally, they get an order from Washington to push a button and vaporize their subjects. It sounds just like -- and the comparison has been made often enough -- a video game, which can be switched off at the end of a shift, after which those pilots return home to families and everyday life. And if you believed what little we normally see of them -- what, that is, the Air Force has let us see (the CIA part of the drone program being off-limits to news reporting) -- that would indeed seem to be the straightforward story of life for our drone warriors. Take Rene Lopez, who in shots of a recent homecoming welcome at Fort Gordon in Georgia appears to be a doting father. Photographed for the local papers on his return from a tour in Afghanistan, the young soldier is seen holding and kissing his infant daughter dressed in a bright pink top. He smiles with delight as the wide-eyed child tries on his military hat. Today, like Gilgamesh of old, signals intelligence personnel connected to the drone programs have started reporting themselves haunted by the deaths that they have participated in, and plagued by the knowledge that, in the end, they often had next to no idea who they were actually killing. The publicity about a “kill list” in the White House has left the impression that those who find themselves on the other end of a drone-launched missile have been carefully identified and are known to the drone pilots. "People get hung up that there's a targeted list of people," one drone pilot told the Intercept two months ago. His view, however, was quite different: "It's really like we're targeting a cell phone. We're not going after people -- we're going after their phones, in the hopes that the person on the other end of that missile is the bad guy." Schei's film also reveals the name of the U.S. Air Force unit that does the CIA killing -- the 17th Reconnaissance Squadron at Creech Air Force Base in Nevada. "From what I was able to gather, it was pretty much confirmed they were flying missions almost exclusively in Pakistan with the intent to strike," Michael Haas, another drone pilot, told Chris Woods at the Guardian. Thanks to the film, Bryant made an unusual connection in the world of drone pilots -- to the victims of Washington’s drone campaign, previously just so many pixels on a screen to him. Invited to Belgium and Norway to speak at the premieres of Schei's film, he met with Shahzad Akbar, a Pakistani lawyer who runs the Foundation for Fundamental Rights and has been leading a campaign to put a face -- quite literally -- on the death and destruction CIA drone strikes have caused in his country. Published in June 2011, the first study by Wayne Chappelle, Joseph Ouma, and Amber Salinas of the School of Aerospace Medicine at Wright-Patterson Air Force Base in Ohio concluded that nearly half of the drone pilots studied had "high operational stress." A number also had "clinical distress" -- that is, anxiety, depression, or stress severe enough to affect them in their personal lives. The study attributed this to long “flying” hours and erratic shifts, but did not compare drone pilots to those in combat aircraft fighting above the battlefield.